To say Xoximilco is to literally have a taste of Mexico. It reminds us what the lifeblood of Mexico is and brings us back to the "Golden Age". Inspired by the Xochimilco of Mexico City, this place located in the Mexican Caribbean, brings together memories, customs, and traditions that are prominent in the flavors of Mexican food, in the lively music that colors the night with its notes, as well as the magic of the decorated canoe-like boats called trajineras. Here are the 5 reasons to visit Xoximilco in Cancun. 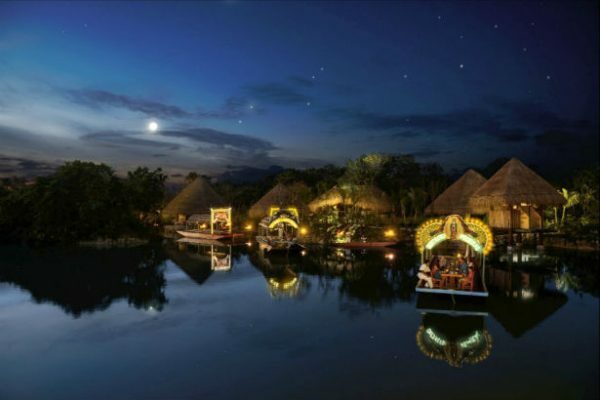 Climb aboard the trajineras, boats that were once used to transport flowers and fruits harvested in the chinampas, or floating gardens -- artificial floating islands built for agricultural purposes on freshwater lakes. These unique, brightly colored trajineras are quite spacious and come with a table and chairs that will ensure you get a comfortable, fun, and unforgettable three hour tour. In the center of the table in the trajinera is tequila, salt, limes, and snacks, and to complement these, another trajinera comes along serving beers, sodas, and flavored waters. Additionally, they offer a three course meal, an exciting experience for the palate. You will taste various flavors including mole poblano, Oaxacan grasshoppers, shrimp, and even barbecue lamb. Lastly you'll enjoy some typical Mexican desserts. 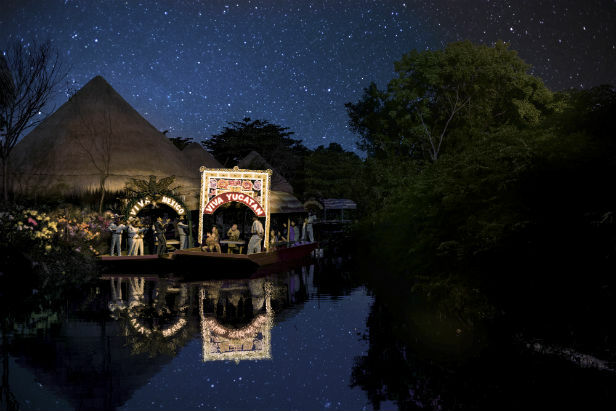 Festive music livens the night and accompanies you as you travel around the different waterways. Get your voice ready because we are sure you'll be singing along with the mariachis and tapping your feet to the beat of the marimba, the quartet from Veracruz, and the soothing sounds of the Yucatan. Next you'll sigh and swoon at the romantic songs from the trio bolero, a type of slow passionate music that originated in Cuba. 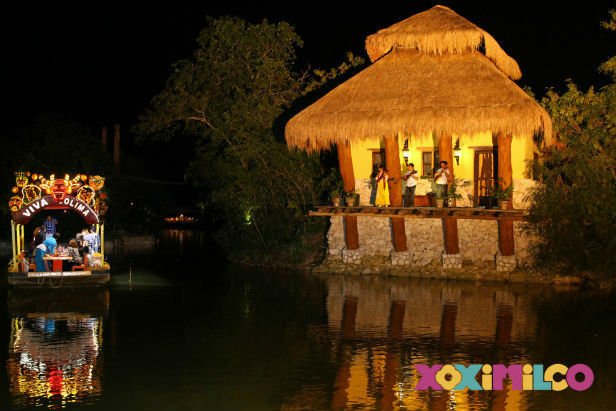 The night, the stars, and the greenery surrounding the waterways bear witness to the laughter and smiles that without question, will come out during your night in Xoximilco. The combination of the different dynamics in the trajinera will ensure a night of unrivaled fun. As we explained earlier, visiting Xoximilco is like taking a trip through time and living Mexico's past. You will learn several legends and stories hidden behind the origin of many Mexican traditions. 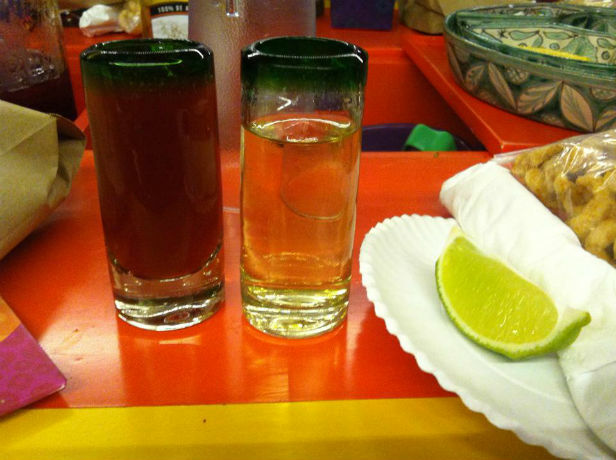 For example, you'll find out why sangrita is the non-alcoholic accompaniment of tequila. 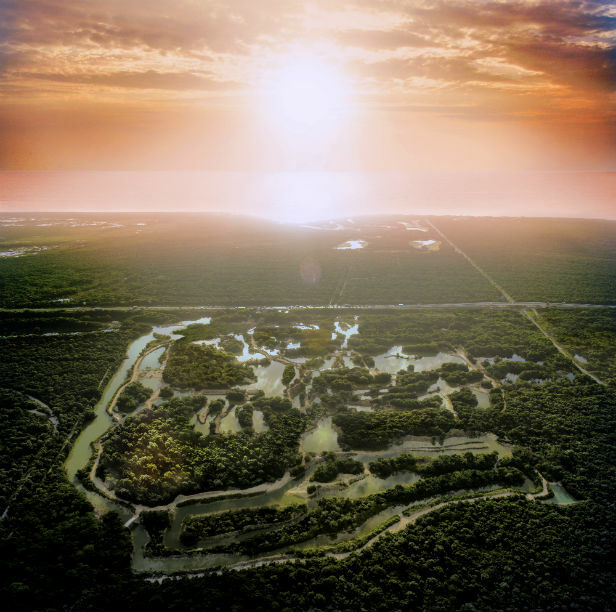 We believe these 5 reasons to visit Xoximilco in Cancun are really just a taste of this beautiful place. We recommend you get the full experience and visit the park for yourself! Photos in this blog courtesy of Xoximilco.